Recently we have been learning about what it means to be a trustworthy team member. There are many times in school and outside of school that we work together with others. In some of these instances, if one person does not play their part well enough, then the team will fail to achieve what they wanted. Koru 1 have identified some understanding of this when we constructed our learner licence criteria, which includes the statement, 'Contributes to a positive, supportive, and exciting learning community'. One of the ways we have brought focus to this is in doing the beep test. Many adults will remember it form their own school days. In pairs, we had one person doing the physical test while the other observed and kept a tally chart of each length run by the first person. 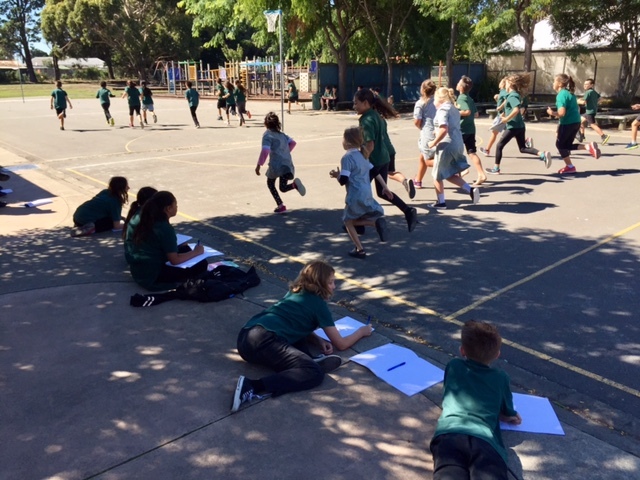 The observer carried a lot of responsibility on their shoulders because the beep test is not easy and everyone running it wanted their scores recorded correctly. We had some great efforts from many of our peers who were running. Talk about getting a sweat up! When it came to the observing, we had lots of successful observers who accurately recorded each of their partner's lengths. However, there were a few instances when concentration lapsed and some observers missed marking lengths. This was an interesting exercise for us, and one we are sure to remember, as the trust that we put into our peers was such an interesting topic for discussion afterwards. Did I show I was a trustworthy partner? Would my partner choose me to work with again? If not, what feedback are they giving me and what does this mean for me in the future? Evidence of our reflections can be found in our digital portfolios. Some of us have also decided to write blog posts about our experience. Wow the beep test was so fun and challenging at the same time. My buddy was Zavier and he was a great buddy, he was able to record my markings with a tally chart and he recorded my scores accurately. I did like the beep test because I had people cheering for me and I did trust my partneer. This was really fun and I thought I had a really trust worthy partner and I hope we do it in the futre it did get a little bit tiring though but it was really fun I thought a I did good and I improve quite a bit cause we did it last year and Inwas only in the 20's and I got 52 or 53 and I think I improved. I really liked the beep test because it was a big challenge. My buddy was Carlos he was a good buddy and i'm pretty shore he thought that i was to. I think i have improved from last year because like Savannah said last year I only got something like 56 and this year I got 88 so i improved by 32 and that is big. I really liked the beep test because it was fun and awsome to do.My buddy was trust worthy he recorded well. It was tiring it was a hole new experience for me it wwas a hole new level and it was good practice for the triathalon and a big thankyounfor miss baker who set it up for us . really hope I would get more in the future. I really enjoyed the beep test because that was my first time doing the beep test and I think I did pretty well because I got 213 runs and I think my buddy got all my runs down. I wish we could do it and I would again in the future. I really enjoyed the beep test because i got to run about 87 times then i gave up because i had the stich and i was pafed and pafed i coudent stund it any more. The beep test was really fun. It was challenging at points, and it got harder as you went. It was really fun though! When the class first did the beep test my buddy ran and I observed.He done really well,and if I can remember of the top of my head I am pretty sure he got 115 but I am not sure. The next week I ran and I got 91. I think I probably could of got at least 100 if i did not get the stitch or get as puffed as I was. when the class first did the beep test my buddy ran and i observed i trusted my buddy because he marked all of my points on the tally chart.when i was running half way throw i got the stich but i didn't give up.i felt so happy because i was the last one standing and if i can remember i got about 210 runs and if the beeper beeped when you wern't at the line you would get a warning and if you did it again you would be out and your buddy would have to count how much you got. Last year room 14 I did the beep test with Mr K when he exsplained the beep test I thought it would be easy. But when I actually did it. It was harder than I thought the beeps got faster & faster its really fun & great exersize. I remember last year I got about 52 runs & this year I got 84. I hope that we can do the beep test again this year 😀. Good job jacob for 213 runs good job everyone in koru one. Koru 1 did exallent at the beep test I think my buddy Luke did exallent I think I did great as well. Hi Koru 1 all of us did great at the beep test me and my buddy Luke got over 100 and good job to the people that were still running after everyone got tird and went out. Also good job to the people that partisapated.